Awesome 6BR/4.5BA Waterfront Home with Huge Pool! New Renovation - Boat LSlip! Beautiful 6BR/4.5BA Pensacola Beach Home with Pool and Boat Slip! Any events (including weddings, parties, reunions, etc.) must be authorized by Gulf Coast Getaways as well as the Island Authority. Please call us to inquire about charges and details. Come to this house if you want the full Beach experience! This house is awesome, bring the entire family, friends, and guests. One of the biggest pools you will find on Pensacola Beach for a private home, with canal views and a tropical setting. Do you have a boat? Or maybe rent a fishing boat for the week and park it in the boat lift right in the backyard. This is a dream home for the fishing enthusiast as you can catch your bait from your dock in the canal. How about nightlife and an awesome place for seafood - Peg Leg Pete's is literally a stone’s throw away. This house has been on the vacation rental market previously, but now it is new and improved. The downstairs is a complete experience on its own, providing a second living area. It has a full-size den with wet bar and TV along with a foosball table and dart board. It also has a brand-new game room with beautiful pool table. This home is a game lover’s dream! The game room includes a private bunk area with 2 sets of queen bunks. In addition, this private lower level has a large bedroom with king bed and flat screen TV. This bedroom opens directly onto the patio and pool area. The entire house has new flat screen TVs, new bedding, new wall art, new living room furniture and several other upgrades. You will not be disappointed! The main living level has 2BRs that share a bathroom, one with a queen and twin, and the other with a queen bed. It has a vaulted ceiling great room with fireplace, designer chef’s kitchen with eat in table and kitchen bar, and a separate dining room. An additional half bath and laundry room are just off the kitchen. Both the living and kitchen open onto a large deck overlooking the pool and canal. The upstairs has two master bedrooms, one with two queens and bathroom, the second with a king bed and bathroom with large jetted tub. Both bedrooms have a private balcony for enjoying the views! Additionally, we have added a twin Ottoman sleeper in the upstairs landing along with a comfortable seating area. Again, you will find the perfect balcony off the landing for beautiful sound views. This is the perfect place to watch the sunset. Amazing! Book your Beach Celebration with family and friends today. This is the perfect destination. Rain or shine, this is the place to be!! NOTE: Small pool is not a hot-tub. Knowledgeable and helpful. Text/email conversations were well timed and helpful to our trip. Made planning easy! 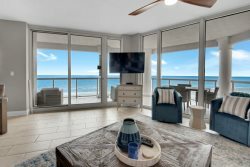 A memorable vacation-had everything we could ever have wanted- clean, comfortable, beautiful home with stunning views close to the beach, an amazing pool, upgraded appliances, well spaced living areas, ...& much more. Cant say enough good things. Would definately rent again! Very friendly and even when I left message they got back to me that day within hours. Love love love - hope to rebook next April!